A German collector is refusing to pay for a painting by Giorgio de Chirico bought at Sotheby’s in London for £398,500 amid suggestions that the work may be fake. The dispute over the work, which is included in the artist’s catalogue raisonné, raises serious questions about the artist’s market and the reliability of the publication, which is normally regarded as the ultimate authority on issues of authenticity. The disputed canvas, Le Muse Inquietanti, 1951, bears the signature of the artist and an inscription in Italian on its reverse, purportedly by De Chirico, which authenticates the painting. It was consigned to Sotheby’s by an Italian private collector and sold at the 20th-century Italian art auction on 17 October last year. After the sale, the collector who bought the work discovered that it is one of 117 paintings included in De Chirico’s catalogue raisonné that were identified by the late Italian forger Renato Peretti in 1978 as fakes or likely fakes that he had painted himself. 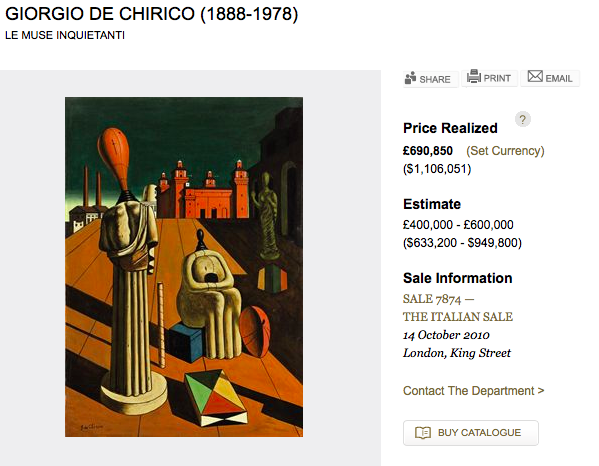 Sotheby’s says it “would not discuss confidential client matters” but adds that the auction house “takes matters of authenticity very seriously and, before accepting works [by De Chirico] for sale, checks the De Chirico catalogue raisonné and also consults the De Chirico Foundation as appropriate”. The German collector declined to comment. Paolo Picozza, the president of the De Chirico Foundation, says that the painting sold at Sotheby’s is authentic (see above) and describes Peretti as a “mythomaniac” who claimed to have painted works that were in fact original canvases by De Chirico. Nevertheless, Picozza acknowledges that “there may be forgeries by Peretti and others in the catalogue raisonné”. He says, however, that “these need to be examined case by case and not [considered fake] just because Peretti said they were”. He also says that, as a general rule, the foundation does not provide opinions on the authenticity of paintings that are published in De Chirico’s catalogue raisonné, and that there are currently no plans to examine further the works in the catalogue that Peretti claimed to have made himself. Any such investigation would be lengthy and expensive, and it is unclear how the foundation could fund this research; the organisation is currently working on a further four volumes of the artist’s catalogue raisonné (to add to the eight volumes that have already been published). The first of these should be completed this year. The dispute over the painting that sold at Sotheby’s was first reported on the website of the Archive of Metaphysical Art, an independent organisation run by specialists in Milan. It estimates that Peretti forged around 1,000 paintings by De Chirico and other Italian artists, including Giorgio Morandi, De Pisis and Carrà, between 1954 and 1976. 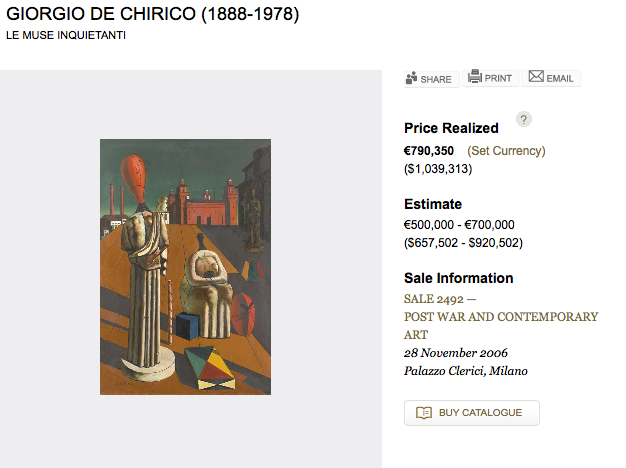 According to the archive’s website, several paintings by De Chirico, which Peretti said were his fakes, are “still in circulation today” and are regularly sold by auction houses as authentic works. 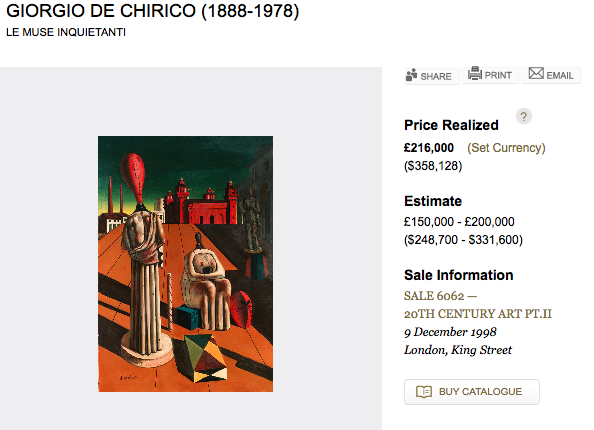 In recent years, paintings by De Chirico that were identified by Peretti as his own work have been sold at Sotheby’s in London and Milan and at Dorotheum in Vienna, and have been offered at Christie’s in London. 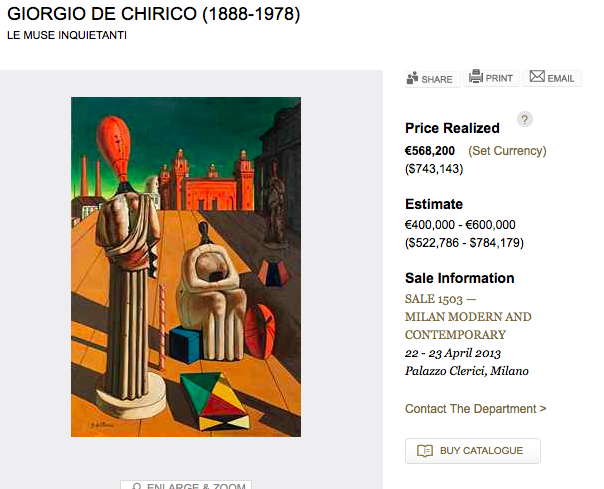 All three auction houses declined to say whether they consult Peretti’s 1978 list of fakes in the catalogue raisonné when accepting works by De Chirico for their auctions; all three said they had relied on the catalogue raisonné to authenticate the paintings in question. 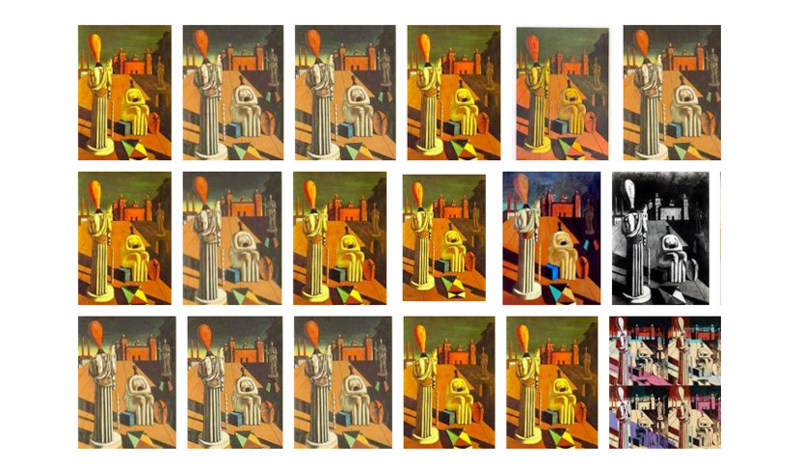 In 1954, Renato Peretti visited De Chirico in Venice and watched the veteran artist paint a version of Le Muse Inquietanti from a photograph of a previous canvas of the theme, according to the Archive of Metaphysical Art. Peretti presented himself to De Chirico as a “simple admirer” of his work, but the visit seems to have inspired Peretti, who “discovered his own vocation” as a result. 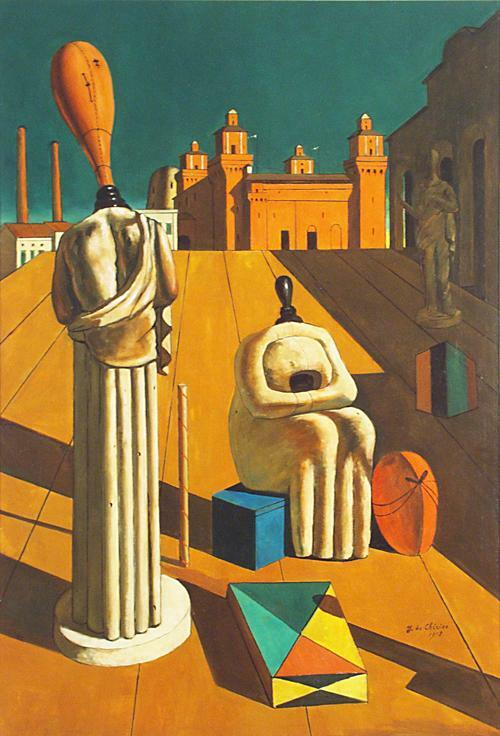 Over the next two decades, he would go on to produce numerous forgeries of De Chirico’s work. In the late 1970s, Peretti was detained as part of a massive investigation into fakes, during which the forger Umberto Lombardi, and several dealers and collectors, were arrested. Hundreds of paintings were confiscated. Peretti died before the conclusion of the trial. Shortly before his death, Peretti produced a list of fakes and likely fakes that he said he had painted himself and which had been included in the volumes of De Chirico’s catalogue raisonné published at the time. These included Piazza d’Italia, 1964 (below), which was offered at Christie’s London in 2007 (est £200,000-£300,000, bought in). The list was first printed in 1979 by the Italian art magazine Bolaffi Arte. In the accompanying article, the journalist Carlo Accorsi (a nom de plume for the magazine’s editor, Umberto Allemandi, later the founding publisher of The Art Newspaper) suggested that fakes had made it into the catalogue raisonné because its editor, Claudio Bruni, had examined these, and others, using photographs and had not seen them in person. Allemandi also revealed that De Chirico’s lawyer, Mr De Luca, had written to Bruni on 21 April 1977 expressing the artist’s concern that numerous forgeries appeared to be in the catalogue. De Luca asked Bruni to suspend the publication of forthcoming volumes of the catalogue. The letter was written after Italian investigators seized numerous paintings that De Chirico said were fakes but which had been included in the catalogue. At the conclusion of the trial, around 50 paintings were destroyed. But many more were returned to their owners, despite the fact that they were also fake, Baldacci and Roos say. They say this accounts for the numerous forgeries still circulating today.